Welcome to Ralfe Electronics, we buy and sell professional used test equipment and second hand test equipment. Whether you are looking to buy or sell test equipment we can help you. We offer very competitive and fair prices for your ex-demo or used test and measurement equipment. We are the UK's best known and most trusted independent suppliers and buyers of used and second hand test equipment. 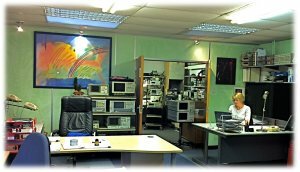 We supply test equipment from leading manufacturers such as Agilent, Anritsu, Wandel & Goltermann, HP, IFR Marconi, Rohde & Schwarz, Tektronix and Lecroy. many items reduced to clear shelves! Optical programmable Attenuator, includes MTA100 rack-mountable mainframe, MTA150 GPIB controller cassette, and 8 MTA300 attenuator cassettes. We can provide your company with all types of service including test equipment sales, rental, calibration, and also repair. We have the ability to source used test equipment worldwide. We always aim to provide our customers with high quality pre owned test equipment resulting in huge savings over new. We specialize exclusively in the sale of second hand Test Equipment and high end professional Electronic Test and Measurement equipment. All equipment checked by external lab under ISO9001 specifications. Please goto the ‘Current Stock Page’ to view our full list of equipment. You can also view a full stock list by selecting the Full Stock list option. Alternatively you can use the quick find option on this page. Current Categories Include: 50ohm probe, AC Neutral Monitors, Active Probes, Adapter Kits, Amplified Light Wave Converter, AMPLIFIERS, Broadband Analysers, CABLE TESTERS, Calibration Kits, Comms test, CURRENT SOURCE, Data Communication Test Sets, Ethernet Modules, FIBRE OPTIC, FIBRE TEST, Frame Analyser, Frequency Counter, Function Generators, Fusion splicers, IO Modules, LASER SOURCES, LEVEL GENERATOR, Level Meters, lightwave analyzer, Modulator, Network Testers, Optical Attenuators, Optical Detectors, Optical Measurement Systems, Optical Power Meters, Optical Receivers, OPTICAL TEST, Oscilloscopes, Phase Meters, Phase Shifter, Plug In Modules, Portable Test Tablets, POTs Testers, Power Meters, Power Sensors, Power Supplies, Printers, Probes, Protocol Analysers, RALPHE, RESISTANCE METERS, SDH/PDH Testers, Signal Generators, Spectrum Analysers, Switch Control Units, Test Fixtures, test set, Transmission Analysers, Transmission test Sets, used electronic test equipment, Voltmeters, VXI Plug In Cards and Modules. Stocked Products By: Agilent/HP, Anritsu, Bruel & Kjaer, ERICSSONS, EXFO, Flann Microwave, GIGATRONICS, IFR, IFR Marconi, ILX LIGHTWAVE, JDS, KEITHLEY, KENWOOD, METRIX, Network General, PHOTONETICS, Racal Dana, RALPH, Rohde & Schwarz, Tektronix, Wandel & Goltermann. We have the following product codes in stock: 1144A, 11852B, 11906D, 11980A, 11982A, 1503B, 16047B, 16196A and B, 16534A, 1998, 220, 2312, 27072, 2850, 34901A, 34907A, 4328A, 4329A, 437B, 4426, 44471A, 44474A, 4936A, 5347A, 5352B, 6060B, 6115A, 6624A, 6644A, 6824A, 70000, 70420A, 70429A, 80320A, 80401A, 8153A, 83411C, 83440C, 83480A, 83482A, 83484A, 8447E, 8447F, 85024A, 8502A, 8502B, 85050D, 8560EC, 8561B, 8702B, 9301A, AK02, AMIQ, AWG2005, DA30, DAB-3801Y1, DLM-20, E2697A, E4209B, E5200A, E5574A, E8491A, FSU995FA, IQ-203, J2171A, J2215A, J2294C, J2296D, J2523B, J3328A, J3458A, J3766A, J3911A, J3914A, J3915A, J3921A, J3953B, J3972A, MA2442A, ME3620A, MN960SA, MN9610A, MN9611B, MP1520B, MPS-8033, MS09C1, MS8604A, MT9810A, MTA100, N1610A, N2727A, NAS, NRT, OLP1/2/25, OX863, P6201, PA-41, PF4, PJM4S, PS20, RALPH RALPHE, second-user test equipment, secondhand test equipment, SMG, SMIQ02, SMIQ03B, SMY02, Sniffer, Test Equipment Wanted, TUNICS-MC, URY, used electronic test equipmen, used electronic test equipment, used T&M, used test equipment.